“To my dear brother, our city Priluki was taken over quite suddenly and very quickly by the German occupiers. My brother – you cannot imagine what terrible months we have been through - famine, extreme cold, abuse, looting, humiliation…. I wanted to die so many times instead of continuing this life! Even when I regretted not dying in the bombings, I still retained one hope – to see you again – even if for just a minute – before my eyes are closed. But this wish will also not be realized. Yuzik, I know that tomorrow is my last day, but I am strong and do not fear the end of my life. I am certain that you will avenge the death of your sister. Take revenge on those responsible for the deaths of Tulya, Mara and thousands of others. I kiss you and send greetings to your friends, to my brothers and sisters and, I hope, that one day you will avenge our spilt blood." This farewell letter, which is now yellow and fading, is signed Eleonora Parmut, from the city of Priluki, Ukraine. She was 15 years old and was not expecting a miracle. It was clear to her that within hours of the ink drying on the paper, they would stand her in a line, would aim their rifles at her and her body would plunge into the killing pit. And that is how it was. Around 6,000 Jews lived in Priluki at the end of the 1930s. Many of them fled in September 1941 when the city was seized by the Nazis. Some of those left were sent to the ghetto and others were sent to hard labor that many did not survive. In the end, the majority of the Jews remaining in the city – 1,300 men, women and children were murdered in two operations: In May and September 1942. They were lined up and shot into the killing pits. Some of them were buried alive. But who was this Eleonora Parmut who left us this chilling letter? And what was the fate of her brother Yuzik? The absence of such diaries is not accidental. “The Holocaust in the former Soviet Union was very brief,” she explains. “The country was occupied within several months – the operation was brutal and quick and the Jews were exterminated before they had an opportunity to develop a communal life under occupation. 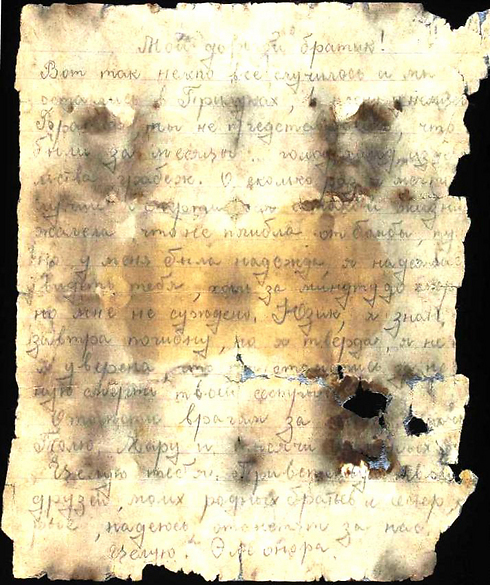 Eleonora’s letter from Priluki was found by Dr. Prais in the Yad Vashem Archives. “Her family members lived in Azerbaijan and kept this letter and her picture like a lucky charm. When they came to visit friends in Israel, they gave the letter and the picture to a woman named Leah Basentin who in turn gave them to Yad Vashem. But she didn’t have any additional information and also didn’t know how to locate the visitors from Azerbaijan. "In the last few years we have tried to make contact with Basentin, without any luck. Let’s hope that as a result of this article someone will turn to us. Perhaps we will be successful and find a clue that will lead us to the relatives of this girl." The written eyewitness accounts speak for themselves. A report from July 16, 1941 which is categorized “Confidential Matter of the Reich” states: "In the first hours after the Bolsheviks’ retreat the local Ukrainian population undertook some praiseworthy actions against the Jews. For example, the synagogue in Dovreimil was torched. In Sambur, 50 Jews were beaten to death by an angry crowd. The Security Police rounded up 7,000 Jews and shot them as revenge for their horrific and inhuman actions." The research at Yad Vashem has led to the conclusion that the Holocaust in the Former Soviet Union must receive special consideration. Masha Yonin, born in St. Petersburg and now working at Yad Vashem, grew up in the shadow of this ambiguity. Unsurprisingly, the KGB did not relate positively towards the Jewish Hebrew studies in private homes. Despite the fear of being sent to prison, the movement’s members continued to meet in the Jewish underground “and alongside learning Hebrew we studied Torah, Jewish history and also about the Holocaust that was never mentioned in the Soviet Union,” Yonin relates. The connection between the Yad Vashem and the government archive in Moscow was established a year before the gates were opened and the establishment of diplomatic relations between Israel and USSR. According to Shalev, only after the fall of the Iron Curtain did the void become apparent. These activities include: Increasing dramatically the collection of materials from archives in Russia, Ukraine, Belarus, the Baltic states and other places; uploading a new and comprehensive website in Russian which incorporates educational materials, virtual tours and online exhibitions; launching a YouTube channel in Russian; increasing the number of academic publications in Russian; displaying various travelling exhibitions in Moscow; publishing stories of the Righteous Among The Nations who functioned in these regions on Yad Vashem’s Russian language website; educational curricula for teachers and for youth movements and more. “We started to photocopy materials from the Special Commission on Nazi War Crimes which had collected reports on what happened to Jews in each and every place. The library directors had no idea what materials were being housed in their archives because they were not permitted to see them,” relates Yonin. The Belarus visit was also a strong personal jolt for her. “My father came from there,” she explains. “I found something that was connected to his aunt who was murdered in the ghetto. Her Russian husband locked her in the house so that she would not be found, and one of the neighbors, who was a policeman, reported to the authorities that a Jewish woman was hiding in that house. In the archive I found his letter informing on her. “We searched thoroughly – until we discovered the fate of each Jew – who died, who fled to the eastern parts of Russia and was able to survive and who went to fight on the front and returned or died there. And so we were able to connect the pieces of the puzzle which until now was full of holes. Dr. Lea Prais, together with her colleague from the Genesis Philanthropy Group, found more than 200 letters in the archive. Many of them, like the letter of Eleonora, aged 15, express the desire for revenge. “We don’t like to stress the part about revenge since generally we want to be perceived as cultured people," says Prais, “but it is impossible to deny the fact that in their final letters upon parting from this life, the Jews expressed anger, humiliation and a desire for revenge. 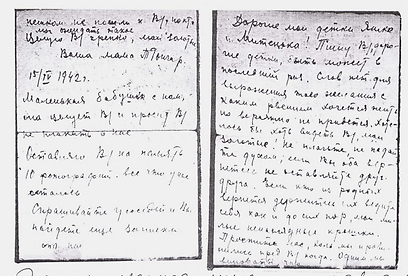 Some of the letter writers did not know what awaited them, but in the project 'The Untold Stories – the Murder Sites of the Jews in the Occupied Territories of the Former Soviet Union,' we will present parting letters from those who perished. They knew that they were going to be murdered and they were totally helpless." Each letter represents a mystery that is not always possible to unravel, like the one from Tomer and Aharon Guntser from Vinnitsa, Ukraine, to their two sons Yasha and Matya who were serving in the Red Army. “I am writing to you both, my dear children, perhaps for the last time. There are no words that can express our passion to continue living but it is clear that this will not be. We would want at least to see you, my dear ones,” their mother writes to them. “Don’t cry. Don’t be sad. If both of you return from the front, don’t abandon each other. Forgive us if we ever hurt you. Our only sin is that we did not walk to where you are, but who could have imagined that this is what was going to happen? The day after writing the letters, the Guntsers were taken to the stadium in Vinnitsa and from there by trucks to the killing pits where they were murdered. The information about the family of Eleonora is also short on details, but Prais focuses on the photo of her where she is holding a book.